Welcome to Dollartosek.com! This currency converter is prepared, and set, to calculate the US Dollar vs the Swedish Krona - in real time. Dollar to the left and Swedish krona to the right. Dollartosek.com gets it's currency values directly from the European Central Bank. So it's updated to get a quick and accurate value between the two currencies. To use our currency converter simple type the value on either side that you want to calculate. To be more accurate use decimals with an dot (.). Example: 12.5 Dollar is going to be calculated to 82.12643 SEK. What's so great with this currency converter is that is converting the currencies instantly while you are typing the numbers! Currency is used 24/7, every day, in countries all over the world. Without national and international currencies, paying for everyday life items and services would be made much less easy. One would think it could be quite practical if all countries in the world used the same currency; unfortunately this is not the case. Because of the many different currencies out there, it is very important for each individual to be well aware of the many different currencies and their use. As they say, knowledge is power and being educated could be what prevents you from being scammed while doing a money exchange, for example. On this website, you will find extensive information about the US dollar and the Swedish krona, which gives you the perfect opportunity to increase your knowledge about the two currencies. In the different articles, you will be able to read up on the history of the two currencies, learn about their general facts and a couple of fun facts about each currency as well as other useful info. This website is also for people who perhaps is planning a vacation or trip to Sweden. Or for the huge mass who is buying and selling things online where the currencies doesn't match. People in Sweden will of course find this currency converter usefull also thanks to the ability to calculate on both sides. Along with the Euro (€), and the Brittish Pound (£), the US Dollar got it's very own unique symbol: $ and for cents is ¢. 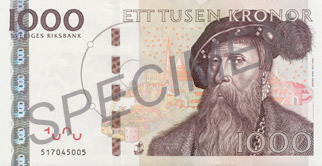 Swedish Krona on the other hand does not got any symbol.